We believe in LOVE at first MUSIC! We lead your child in their musical adventure while allowing them to practice self-expression. Music affects all areas of child development from intellectual, social and emotional to motor, language, and literacy. 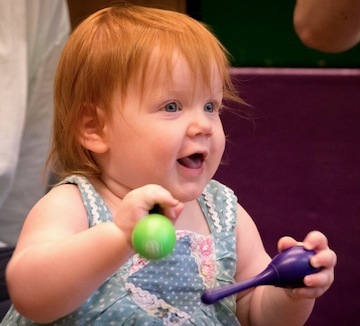 Each weekly Music Together® 45-minute class offers a dozen songs and rhythmic chants, including small- and large-movement activities, and instrument play. Teachers present these fun musical experiences in ways that are informal, non-performance-oriented, and developmentally appropriate for children. Your tuition includes a CD, a digital download code and an illustrated songbook. Families also have access to the Family Music Zone at the Music Together website, where there is a wealth of resources, activities, and information to help you make the most of your experience with us. In addition, families new to the program receive a parent guide booklet, Music and Your Child. Rhythm Kids' tuition includes a djembe drum for initial enrollment. We bring Music Together to your preschool or daycare with programs customized to your center's needs. Learn more about our in-school curriculum. From fam jams to birthday parties, Marsha's Music loves to facilitate music for your special events.